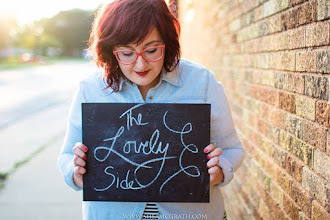 Last Spring I wrote my first story for the Iowa State student-run fashion magazine Trend. 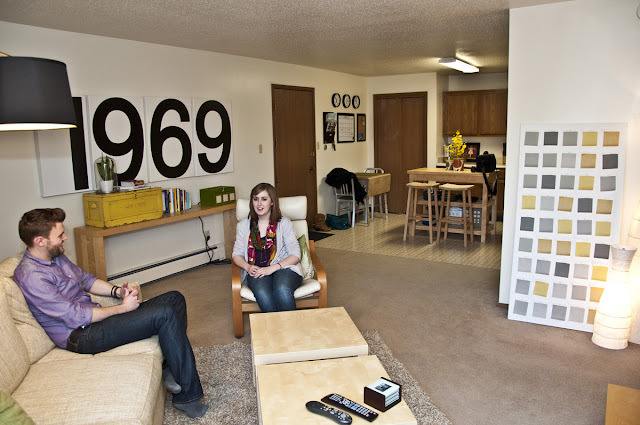 My assignment was to tour a well-decorated student apartment and interview the renter about their design choices. 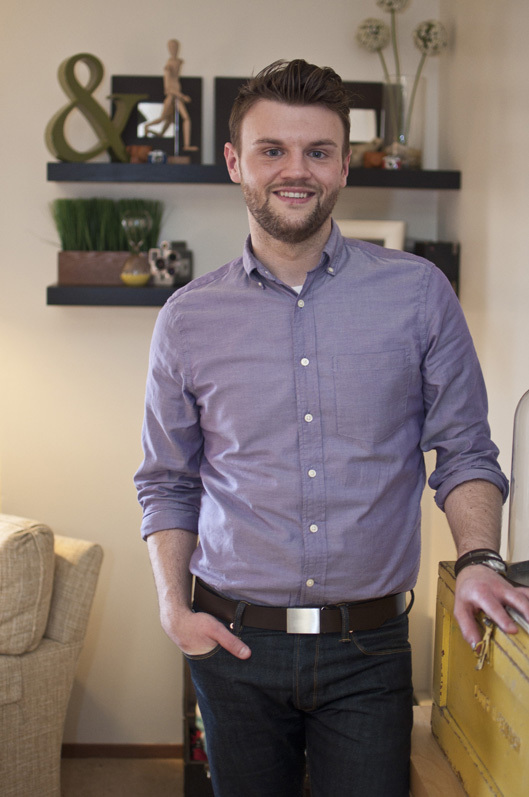 The honor went to Tyler Clarey, a graduate student in Interior Design. Tyler stuck to a neutral palette with pops of color dispersed throughout the apartment. In the back corner of the living room, a vintage suitcase stores blankets. A console table displays his books, a yellow toolbox from Found Things in Des Moines, and a green charging station he scored on sale for only $25 from Pottery Barn. 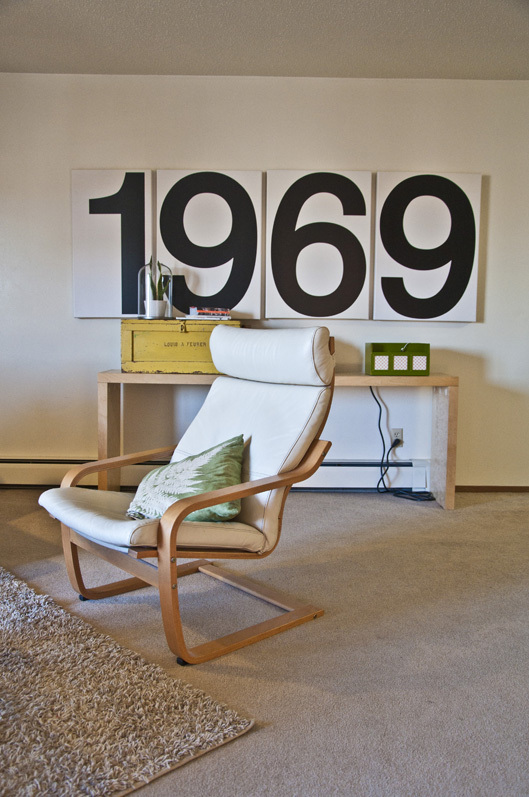 A big fan of typography, the numbers 1969 on canvas make a bold statement on the wall. The chair is from Ikea. 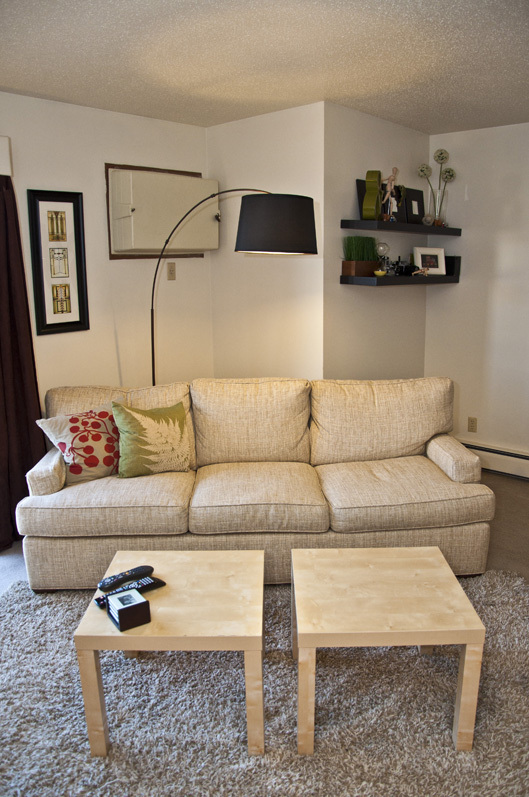 Tyler continued the neutral palette through the rug, coffee tables, and couch. Clutter is kept to a minimum. And while the space is modern and neutral, it is anything but cold. Patterned pillows, rich texture, and artwork warm up the room. Here's a nice view of the living room. 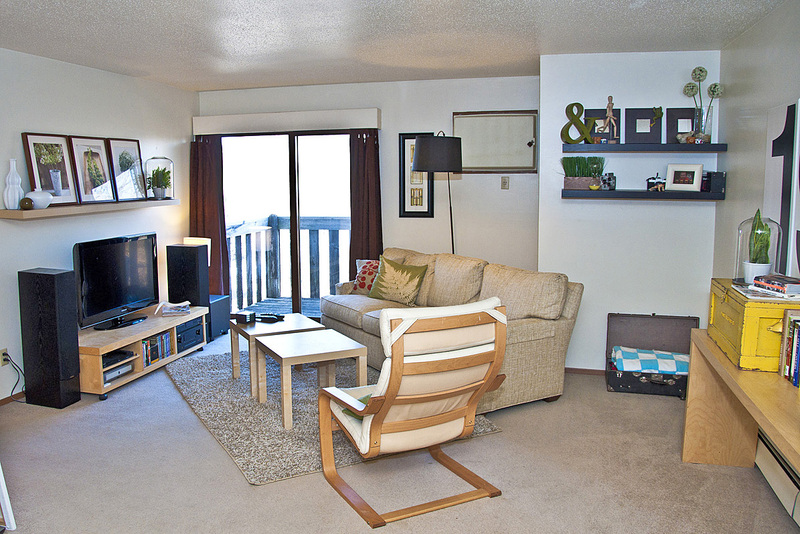 This apartment is such a perfect example of a typical college student apartment. So it's great to see how you can be creative like Tyler in arranging furniture. Putting the sofa, coffee tables, chair, and rug at an angle really opens up the space while keeping it cozy and inviting. It's much better than pushing all the furniture up against opposing walls. 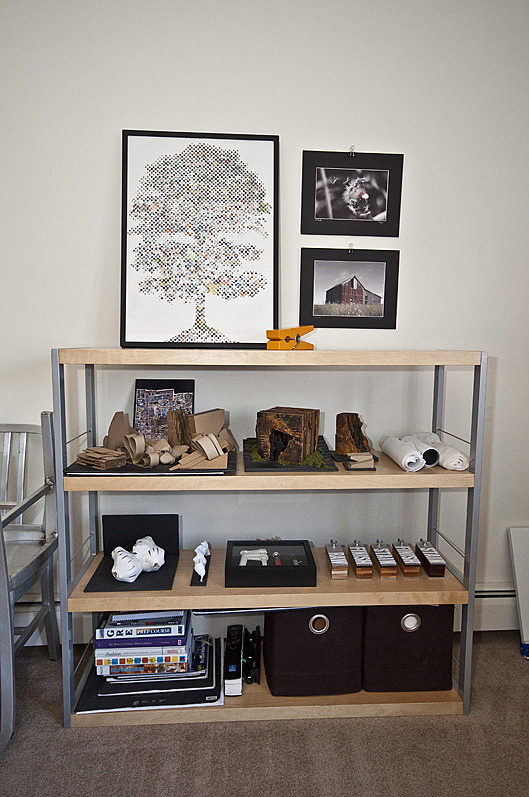 Tyler's work space is designed for creativity. Cubbies in his desk keep clutter tucked away. Design books are close at hand. 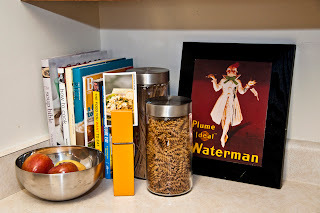 Clipboards on the wall allow for a rotating collection of art that inspires him. And a styrofoam mannequin acts as an inspiration board. 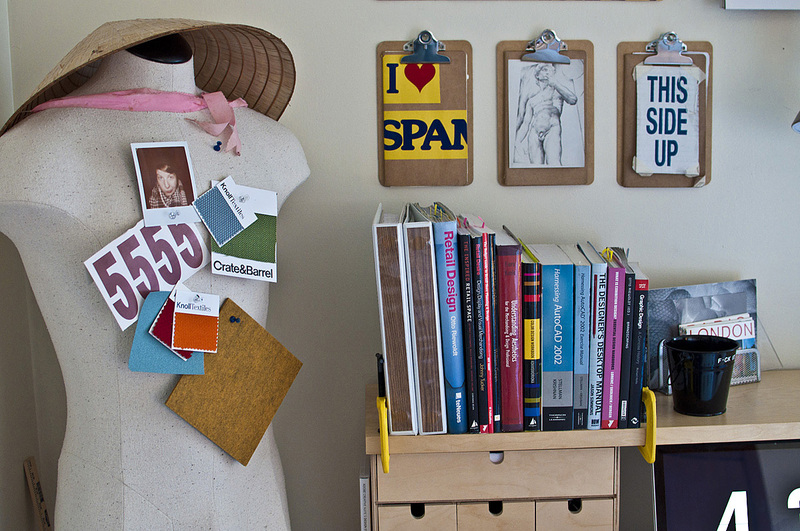 In his office, a bookcase near the desk holds past school projects, paint swatch decks, and additional design books. Artwork decorates the wall above. An island with stools brings additional counter space into the kitchen. 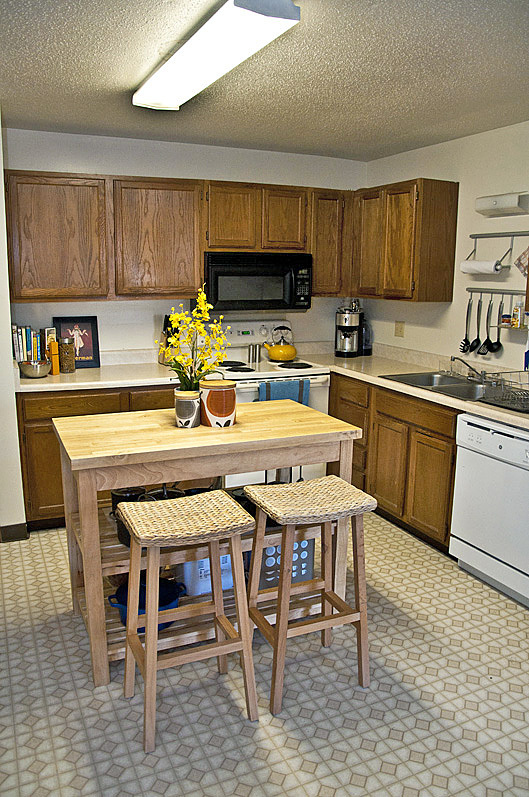 Utensils and paper-towels are kept handy by hanging on the wall over the stove. 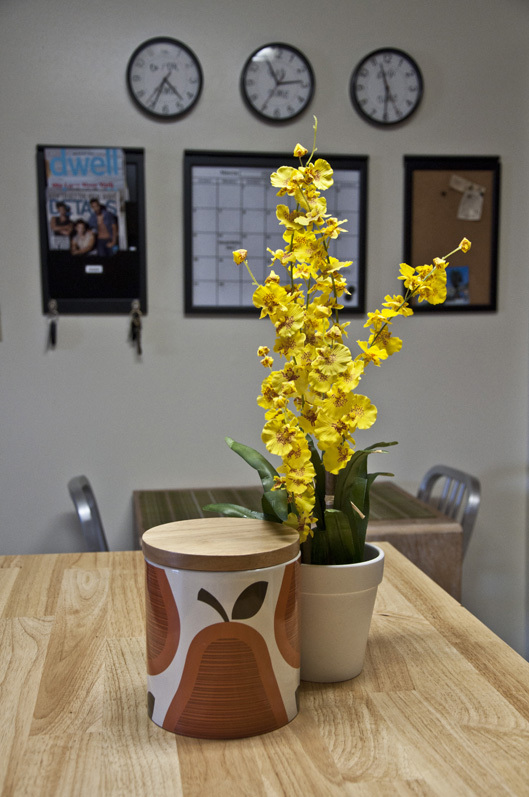 Colorful Orla Kiely canisters and bright yellow flowers take center stage on the island. Tyler and me having a chat in the living room. 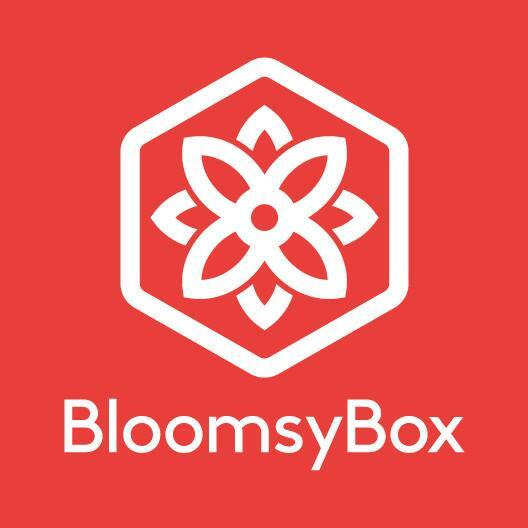 In our convo, we got to talking about blogs. And, of course, I had to show him Lovely Undergrad. Tyler decided to start one of his own: The Refined Graduate. You should definitely head over and check it out--he has great taste. Thanks for sharing your apartment with Trend & Lovely Undergrad, Tyler! The photos used in this post were taken by Lei Zhang. The story layout was designed and put together by Melissa Fallon (yes, of 20goingon80.com!). Apartment was Tyler Clarey's. And the words were written by yours truly! Tyler has fantastic style! I love the "1969" banner in his living room, and he really did a great job of brightening up that kitchen! Tyler is so amazing with it comes to style!! I love it all! Congratulations on getting the article in the mag! The use of neutral palette throughout the apartment works. The apartment looks clean. It was not too bright, and not too dark either. 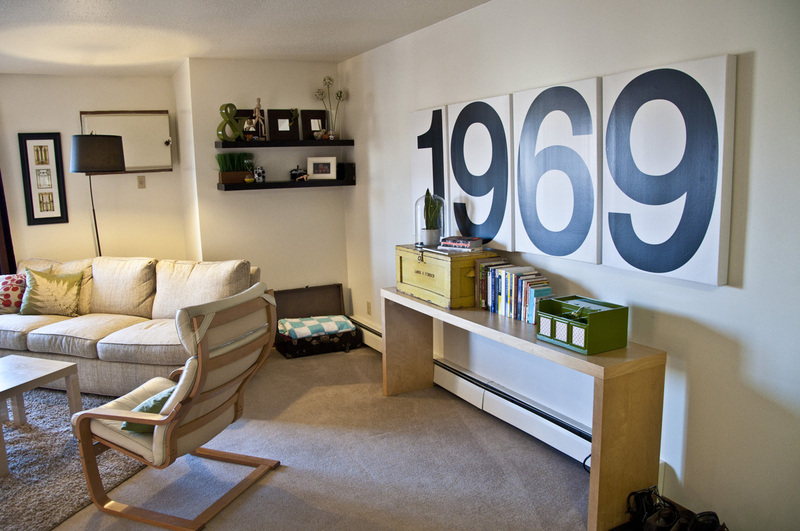 I especially love the number 1969 on the wall, and how he organized his books and artworks. Congratulations as well in getting the article published on the magazine. Congratulations Tyler. The apartment looks clean indeed, especially the kitchen. Love how simple it is. How I wish our kitchen/dining area is as clean as yours, with kids running around. What type of high chairs are those? 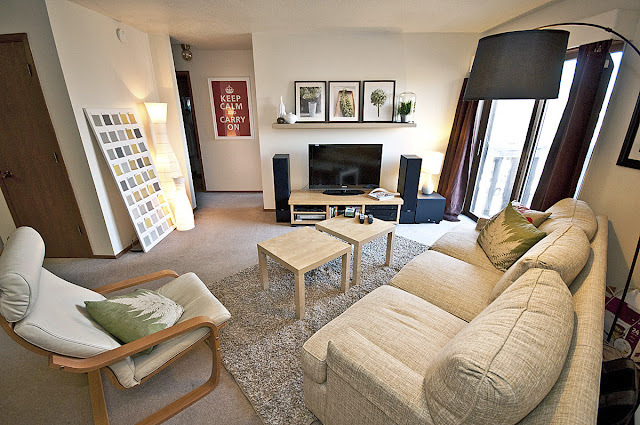 You've got a very great looking apartment. This is a very inspirational interior design. Colors of the walls, curtains and other furniture complement with each other very well. I am going to do some DIY projects to my house I just bought from the homes for sale in Valley Stream NY. I would like to ask a permission about using some of your home design ideas. I remember seeing this article in Trend. Wow, I have loved your site for a couple months now since I found some cute photos thru Pinterest, but I never knew we were both from Ames! Oh, Internet. 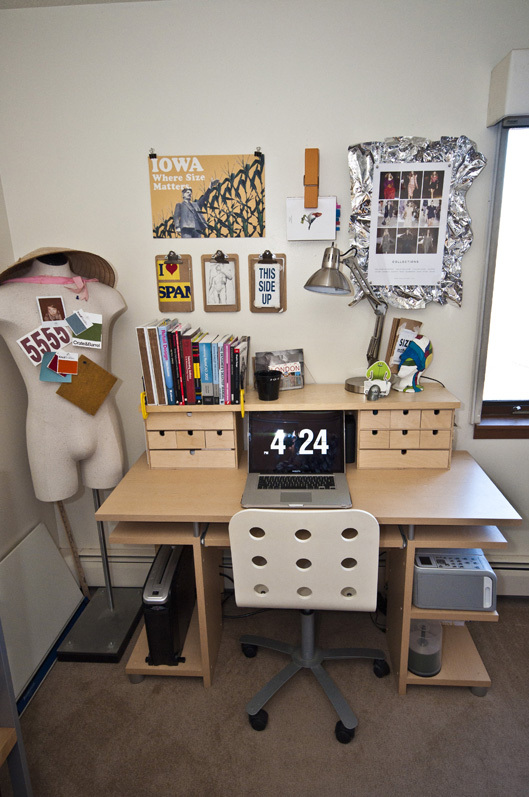 So what is the boldest, most memorable actual dorm room idea that you've seen? I'm living one more year in Eaton Hall next fall and really want to go out with a bang without breaking policy. Help! Where is the desk from? I already know what to put in each cubby! The "1969" is from the Gap isnt it? They were established in 1969 and used very similar wall art in their stores.